The global resource isolated by PID namespaces is the process ID number space. This means that processes in different PID namespaces can have the same process ID. As with processes on a traditional Linux (or UNIX) system, the process IDs within a PID namespace are unique, and are assigned sequentially starting with PID 1. Likewise, as on a traditional Linux system, PID 1—the init process—is special: it is the first process created within the namespace, and it performs certain management tasks within the namespace. A new PID namespace is created by calling clone() with the CLONE_NEWPID flag. We'll show a simple example program that creates a new PID namespace using clone() and use that program to map out a few of the basic concepts of PID namespaces. The complete source of the program (pidns_init_sleep.c) can be found here. As with the previous article in this series, in the interests of brevity, we omit the error-checking code that is present in the full versions of the example program when discussing it in the body of the article. The new child process starts execution in childFunc(), which receives the last argument of the clone() call (argv) as its argument. The purpose of this argument will become clear later. The main virtue of executing the sleep program is that it provides us with an easy way of distinguishing the child process from the parent in process listings. The first two lines line of output from pidns_init_sleep show the PID of the child process from the perspective of two different PID namespaces: the namespace of the caller of clone() and the namespace in which the child resides. In other words, the child process has two PIDs: 27656 in the parent namespace, and 1 in the new PID namespace created by the clone() call. The next line of output shows the parent process ID of the child, within the context of the PID namespace in which the child resides (i.e., the value returned by getppid()). The parent PID is 0, demonstrating a small quirk in the operation of PID namespaces. As we detail below, PID namespaces form a hierarchy: a process can "see" only those processes contained in its own PID namespace and in the child namespaces nested below that PID namespace. Because the parent of the child created by clone() is in a different namespace, the child cannot "see" the parent; therefore, getppid() reports the parent PID as being zero. For an explanation of the last line of output from pidns_init_sleep, we need to return to a piece of code that we skipped when discussing the implementation of the childFunc() function. Each process on a Linux system has a /proc/PID directory that contains pseudo-files describing the process. This scheme translates directly into the PID namespaces model. Within a PID namespace, the /proc/PID directories show information only about processes within that PID namespace or one of its descendant namespaces. The mount_point variable is initialized from the string supplied as the command-line argument when invoking pidns_init_sleep. In our example shell session running pidns_init_sleep above, we mounted the new procfs at /proc2. In real world usage, the procfs would (if it is required) usually be mounted at the usual location, /proc, using either of the techniques that we describe in a moment. However, mounting the procfs at /proc2 during our demonstration provides an easy way to avoid creating problems for the rest of the processes on the system: since those processes are in the same mount namespace as our test program, changing the filesystem mounted at /proc would confuse the rest of the system by making the /proc/PID directories for the root PID namespace invisible. Thus, in our shell session the procfs mounted at /proc will show the PID subdirectories for the processes visible from the parent PID namespace, while the procfs mounted at /proc2 will show the PID subdirectories for processes that reside in the child PID namespace. In passing, it's worth mentioning that although the processes in the child PID namespace will be able to see the PID directories exposed by the /proc mount point, those PIDs will not be meaningful for the processes in the child PID namespace, since system calls made by those processes interpret PIDs in the context of the PID namespace in which they reside. Having a procfs mounted at the traditional /proc mount point is necessary if we want various tools such as ps to work correctly inside the child PID namespace, because those tools rely on information found at /proc. There are two ways to achieve this without affecting the /proc mount point used by parent PID namespace. First, if the child process is created using the CLONE_NEWNS flag, then the child will be in a different mount namespace from the rest of the system. In this case, mounting the new procfs at /proc would not cause any problems. Alternatively, instead of employing the CLONE_NEWNS flag, the child could change its root directory with chroot() and mount a procfs at /proc. # ps -C sleep -C pidns_init_sleep -o "pid ppid stat cmd"
The "PPID" value (27655) in the last line of output above shows that the parent of the process executing sleep is the process executing pidns_init_sleep. The PPid field in the file is 0, matching the fact that getppid() reports that the parent process ID for the child is 0. As noted earlier, PID namespaces are hierarchically nested in parent-child relationships. Within a PID namespace, it is possible to see all other processes in the same namespace, as well as all processes that are members of descendant namespaces. Here, "see" means being able to make system calls that operate on specific PIDs (e.g., using kill() to send a signal to process). 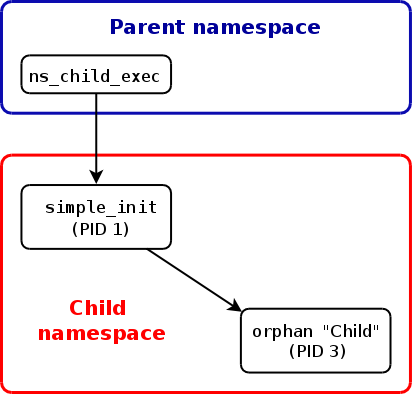 Processes in a child PID namespace cannot see processes that exist (only) in the parent PID namespace (or further removed ancestor namespaces). A process will have one PID in each of the layers of the PID namespace hierarchy starting from the PID namespace in which it resides through to the root PID namespace. Calls to getpid() always report the PID associated with the namespace in which the process resides. We can use the program shown here (multi_pidns.c) to show that a process has different PIDs in each of the namespaces in which it is visible. In the interests of brevity, we will simply explain what the program does, rather than walking though its code. In other words, in the most deeply nested PID namespace (/proc0), the process executing sleep has the PID 1, and in the topmost PID namespace created (/proc4), that process has the PID 5. The first process created inside a PID namespace gets a process ID of 1 within the namespace. This process has a similar role to the init process on traditional Linux systems. In particular, the init process can perform initializations required for the PID namespace as whole (e.g., perhaps starting other processes that should be a standard part of the namespace) and becomes the parent for processes in the namespace that become orphaned. That command line creates a child in a new PID namespace to execute a shell echo command that displays the shell's PID. With a PID of 1, the shell was the init process for the PID namespace that (briefly) existed while the shell was running. Our next example program, simple_init.c, is a program that we'll execute as the init process of a PID namespace. This program is designed to allow us to demonstrate some features of PID namespaces and the init process. The simple_init program performs the two main functions of init. One of these functions is "system initialization". Most init systems are more complex programs that take a table-driven approach to system initialization. Our (much simpler) simple_init program provides a simple shell facility that allows the user to manually execute any shell commands that might be needed to initialize the namespace; this approach also allows us to freely execute shell commands in order to conduct experiments in the namespace. The other function performed by simple_init is to reap the status of its terminated children using waitpid(). The init$ prompt indicates that the simple_init program is ready to read and execute a shell command. We'll now use the two programs we've presented so far in conjunction with another small program, orphan.c, to demonstrate that processes that become orphaned inside a PID namespace are adopted by the PID namespace init process, rather than the system-wide init process. The orphan program performs a fork() to create a child process. The parent process then exits while the child continues to run; when the parent exits, the child becomes an orphan. The child executes a loop that continues until it becomes an orphan (i.e., getppid() returns 1); once the child becomes an orphan, it terminates. The parent and the child print messages so that we can see when the two processes terminate and when the child becomes an orphan. In the above output, the indented messages prefixed with init: are printed by the simple_init program's verbose mode. All of the other messages (other than the init$ prompts) are produced by the orphan program. From the output, we can see that the child process (PID 3) becomes an orphan when its parent (PID 2) terminates. 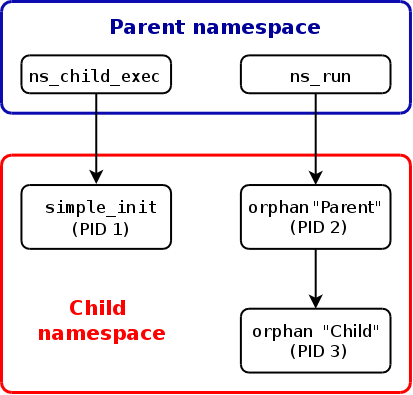 At that point, the child is adopted by the PID namespace init process (PID 1), which reaps the child when it terminates. 举个例子来说，如果init进程并没有建立SIGTERM信号处理函数，那么其他进程是没法向init进程发送SIGTERM信号的，这种“非预期”的信号默认都会被内核全部忽略掉。This prevents the init process—whose presence is essential for the stable operation of the system—from being accidentally killed, even by the superuser. 同样，内核在实现pid namespace的时候，为namespace里的init进程【pid为1的进程】保留了相应的类似的功能，同一个namespace下的进程（即使是root进程）也只能向init进程发送已被init进程明确建立信号处理函数的信号，This prevents members of the namespace from inadvertently killing a process that has an essential role in the namespace. Note, however, that (as for the traditional init process) the kernel can still generate signals for the PID namespace init process in all of the usual circumstances (e.g., hardware exceptions, terminal-generated signals such as SIGTTOU, and expiration of a timer). Signals can also (subject to the usual permission checks) be sent to the PID namespace init process by processes in ancestor PID namespaces. Again, only the signals for which the init process has established a handler can be sent, with two exceptions: SIGKILL and SIGSTOP. When a process in an ancestor PID namespace sends these two signals to the init process, they are forcibly delivered (and can't be caught). The SIGSTOP signal stops the init process; SIGKILL terminates it. Since the init process is essential to the functioning of the PID namespace, if the init process is terminated by SIGKILL (or it terminates for any other reason), the kernel terminates all other processes in the namespace by sending them a SIGKILL signal. Normally, a PID namespace will also be destroyed when its init process terminates. However, there is an unusual corner case: the namespace won't be destroyed as long as a /proc/PID/ns/pid file for one of the processes in that namespaces is bind mounted or held open. However, it is not possible to create new processes in the namespace (via setns() plus fork()): the lack of an init process is detected during the fork() call, which fails with an ENOMEM error (the traditional error indicating that a PID cannot be allocated). In other words, the PID namespace continues to exist, but is no longer usable. In the previous article in this series, the /proc filesystems (procfs) for the PID namespaces were mounted at various locations other than the traditional /proc mount point. This allowed us to use shell commands to look at the contents of the /proc/PID directories that corresponded to each of the new PID namespace while at the same time using the ps command to look at the processes visible in the root PID namespace. The ps a command lists all processes accessible via /proc. In this case, we see only two processes, reflecting the fact that there are only two processes running in the namespace. When running the ns_child_exec command above, we employed that program's -m option, which places the child that it creates (i.e., the process running simple_init) inside a separate mount namespace. As a consequence, the mount command does not affect the /proc mount seen by processes outside the namespace. In the second article in this series, we described two system calls that are part of the namespaces API: unshare() and setns(). Since Linux 3.8, these system calls can be employed with PID namespaces, but they have some idiosyncrasies when used with those namespaces. Specifying the CLONE_NEWPID flag in a call to unshare() creates a new PID namespace, but does not place the caller in the new namespace. Rather, any children created by the caller will be placed in the new namespace; the first such child will become the init process for the namespace. The fd argument is a file descriptor that identifies a PID namespace that is a descendant of the PID namespace of the caller; that file descriptor is obtained by opening the /proc/PID/ns/pid file for one of the processes in the target namespace. As with unshare(), setns() does not move the caller to the PID namespace; instead, children that are subsequently created by the caller will be placed in the namespace. The program uses setns() to join the namespaces specified by the /proc/PID/ns files contained within -n options. It then goes on to execute the given command with optional arguments. If the -f option is specified, it uses fork() to create a child process that is used to execute the command. Looking at the output from the "Parent" process (PID 2) created when the orphan program is executed, we see that its parent process ID is 0. This reflects the fact that the process that started the orphan process (ns_run) is in a different namespace—one whose members are invisible to the "Parent" process. As already noted in the previous article, getppid() returns 0 in this case. The following diagram shows the relationships of the various processes before the orphan "Parent" process terminates. The arrows indicate parent-child relationships between processes. The "Child" process (PID 3) created by the orphan program was reaped by simple_init, but the "Parent" process (PID 2) was not. This is because the "Parent" process was reaped by its parent (ns_run) in a different namespace. The following diagram shows the processes and their relationships after the orphan "Parent" process has terminated and before the "Child" terminates. It's worth emphasizing that setns() and unshare() treat PID namespaces specially. For other types of namespaces, these system calls do change the namespace of the caller. The reason that these system calls do not change the PID namespace of the calling process is because becoming a member of another PID namespace would cause the process's idea of its own PID to change, since getpid() reports the process's PID with respect to the PID namespace in which the process resides. Many user-space programs and libraries rely on the assumption that a process's PID (as reported by getpid()) is constant (in fact, the GNU C library getpid() wrapper function caches the PID); those programs would break if a process's PID changed. To put things another way: a process's PID namespace membership is determined when the process is created, and (unlike other types of namespace membership) cannot be changed thereafter.